To give the new Sienna a more aggressive and sporty stance, Toyota gave it wide shoulders, a hidden door shoulder and iconic D-pillar. LOS ANGELES -- Still seeing value in the minivan segment, Toyota unveiled its redesigned 2011 Sienna today at the auto show here. Designer Ian Cartabiano said the top priorities in the redesign were an expressive exterior, a more spacious and comfortable interior, and safety. The vehicle comes in five trims, including a new sport model. A 2.7-liter four-cylinder engine making 187 hp has been added to the lineup. The 266-hp, 3.5-liter V-6, which powers the predecessor, still is available. A new six-speed automatic transmission replaces the five-speed automatic on the 2010 model. The four-cylinder delivers 19 mpg in the city and 26 on the highway, while the V-6 delivers 18/24, compared with 17/23 for the current model. The redesign is a total U.S. project -- the exterior done at Toyota facilities in California and the interior in Michigan. The vehicle rides on the same 119.3-inch wheelbase but is wider and slightly shorter. The face is more aggressive and the rear rounder, moving away from the boxy minivan look. To give the vehicle a more aggressive and sporty stance, Cartabiano said Toyota gave it wide shoulders, a hidden door shoulder and iconic D-pillar. The new sporty SE trim sits lower on a sport-tuned suspension and boasts 19-inch wheels, a first for the minivan. Interior designer Benjamin Jimenez said comfort was top of mind for the inside. 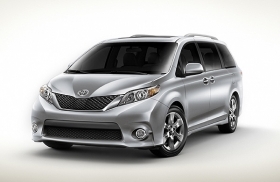 The minivan comes in seven- and eight-seat configurations vs. only seven seats for the 2010 model. The interior is more than two inches longer, and the seats can move forward and backward at a longer range. There also is more room between the passenger and driver to provide more personal space. On the most upscale Limited trim, there are foot and leg rests in the second row, like a La-Z-Boy chair. Second-row seats in every trim move out of the way with one touch to gain easy access to the third row. On eight-passenger trims, the second-row center seat can be removed and stowed. When stowed, a cupholder and storage tray are revealed. A sliding center console on the Limited and XLE all-wheel-drive trims can be shared between the front and second rows. Second-row captain's chairs are available on all grades. The third row easily folds flat with one touch. The Limited model also features a dual moonroof with mood lights in the rear. New for Toyota and the Sienna is a dual 16-inch screen in the second row, allowing two passengers to enjoy separate activities. Also new for Toyota and Sienna is a Panorama Camera rear monitor. It provides two views behind the vehicle, including a 180-degree view and backup guides. Stability control is standard on all trims, as are seven airbags plus a new driver's side knee airbag. “More room and interior space will be our competitive edge,” Jimenez says. The vehicle goes on sale in February.